One of the first things many people think about when they have a long flight ahead is that they should use the time as an opportunity to get some sleep. While it’s a good thought, most of us have trouble getting a decent nap, let alone a few hours of sleep. “Everyone wants to get some rest on the airplane,” says flight attendant Betty Thesky, on Yahoo. "But crowded airplanes, small seats, and crying babies don’t always dovetail with restful slumber,” she adds. Sleeping on a plane can be a challenge. The seats are uncomfortable and there are distractions, yet we still try our best. No one wants to spend the first 36 hours of their holiday recovering from a flight and shaking the effects of jet lag. Adjust your expectations: Don’t expect to sleep as comfortably or for as long as you do in your own bed. 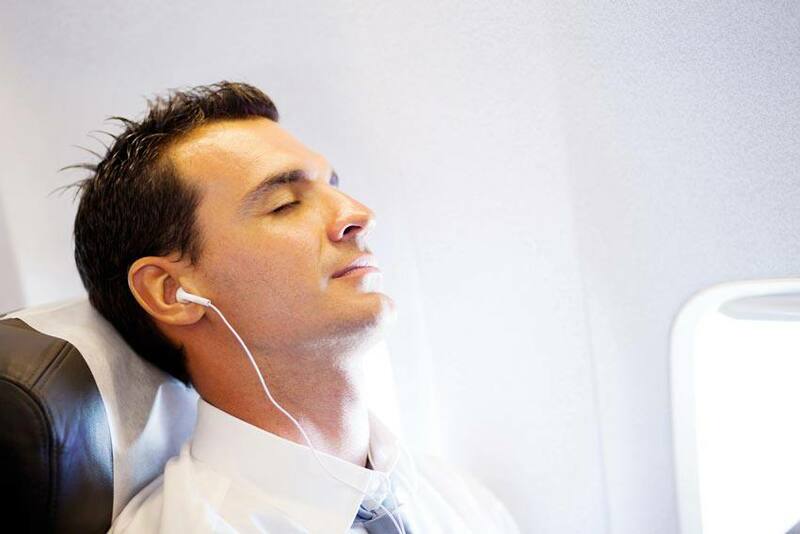 Understand that even on long flights, you may only get an hour or two of sleep, and odds are that it may be in spurts throughout the flight. Choose your seat wisely: If possible, choose the window seat. You will at least be able to lean against the window and get a little more comfortable. If you have the chance, opt for the emergency exit seats to get more leg room. Invest in a neck pillow: If you have never used a neck pillow before, you don’t know what you are missing. Neck pillows not only provide you with more comfort, they also reduce the chance that you will fall asleep in an awkward position and wake up with a stiff neck. Dress in layers: Dressing in layers will not only reduce the weight of your luggage, it will also give you sleep options. Layers allow you to remove or add clothing so you can get comfortable. You can also use your sweater or jacket as a blanket if you get cold. Recline your seat: Recline your chair if possible, especially if you are on a long flight. “Reclining your chair will help ease some of the pressure on your lower (lumbar) spine. With less pressure on your back, it’ll be easier to fall asleep,” says Amy Eisinger on Greatist. Avoid too many carry-on bags: If you board your flight late, you end up having to put your carry-on bag and items under the seat in front of you. This will limit your leg room and impair your ability to get comfortable. Skip the morning coffee: Skipping coffee on the day of your flight will help your body feel more relaxed, and you will be able to sleep more easily. Bring a sleep aid: For those who have a really tough time getting some shut-eye, perhaps a sleep aid is worth trying. Melatonin is a great over-the-counter option. However, you should use a sleep aid only if you know how it affects you or if you are travelling with others. Avoid overeating: While it’s a good idea to have a good meal before your flight (especially considering the costs of airline food! ), it’s important not to overeat, and avoid foods that you know could upset your stomach. Headphones: These are a great option to cut out background noise and allow yourself to drift off into your own world. You can listen to music, put on a track to help you sleep or even add a recorded meditation program to help you relax and regenerate.